Yesterday was my final Cake Decorating Basics class and I can’t believe how much we’ve covered. More importantly, I can’t believe I can decorate a cake. It’s decorated crudely, but I’ve been told with practice, I’ll get better. Still I’m really proud of what I’ve accomplished. My final project... YEAH RIGHT!!! Bring in a 8” cake frosted and filled – I used a box cake (shame on me) and filled it with cherry puree. Make a couple batches of Wilton’s Buttercream Icing and make several colors. Class number three was one of those classes that was so jam-packed, it probably could have been 2 classes. I left exhausted, covered in frosting and sweating (I’ll get to that later). Still, it was a lot of fun and I learned a lot. As a reminder, the cupcakes and filling were from a Lemon Layer Cake recipe which included a Lemon Curd and the icing was a Wilton Buttercream recipe colored with Wilton Icing Colors. We started by filling our cupcakes which created some issues for me. For some reason, I had a lot of issues measuring the disposable bag with the Bismarck tip. I ended up with curd (hehehe – I have no idea why this word makes me laugh) all over my hands as it squeezed out from around the tip. I would have taken a picture, but my hands were covered and if I ruined my phone, my husband would kill me. I did manage to get them filled with at least the tiniest bit of curd. We are having an unseasonably warm spring in the Chicago area. It has been in the 70s and 80s for most of March… MARCH! If you’re keeping score, last winter/early spring, we had a blizzard that dumped 24-inches of snow on us and this year, it was bikini weather. Not that this body would EVER leave the house in a bikini. I wore a turtleneck the entire 2 years I lived in Hawaii. Anyway, most large retail buildings don’t have their systems set to kick on the air conditioning until May. I’m going to assume that the building in which Michael’s resides is one of them. The room was blazing hot and unfortunately not only did it affect my deodorant’s ability to keep up with body odor, it also affected my frosting. Keep that in mind as we take a drive down My Memory Lane with the pictures. First we practiced the DROP FLOWER. The technique is holding the tip just to the surface, letting the frosting build up around the tip and then remove the tip/bag letting the frosting form upward. If you look to the top left, you’ll see one that kind of made it. Unfortunately, the frosting wouldn’t stand straight up (even after I added about 1/2-cup of powdered sugar) because of the heat. Of course, my technique wasn’t the best either. Nacho Cheese Beef Bake recipe originally published in Taste of Home – August 2011. I’m always looking for a delicious casserole recipe and I love Mexican food, so this recipe seemed like the perfect match. I also liked the convenience factor. Most everything was canned (and I could buy healthier versions than specified) and what wasn’t, I could buy per-sliced or shredded… except for the chips, but crushing chips isn’t all that difficult. I didn’t pile everything on top of the casserole like they did in the picture because I wanted the picture to show the casserole underneath. As you can tell, I did a horrible job at showing the casserole. I cook. I'm definitely not a photographer. From what I can tell, my casserole looks slightly “soupier” which I’m not sure if I like or not. Still, my food looks delicious and I was ready to eat it as soon as the picture was taken. So I’m going to confess that I didn’t practice what I learned in Class #1 at home. Not because I didn’t want to. It’s just that time got away from me. Before I knew it, I needed to go grocery shopping and bake for the next class. I solemnly swear that I will at least try to practice what I learned this week. Of course, I’ve gained a couple of pounds (and so has the husband) already, so the prospect of baking more cakes kind of scares me. For the cake and cupcakes, I made a Lemon Layer Cake which included a Lemon Curd. I documented that process here if you're interested in my tasty cake. The icing was a Wilton Buttercream recipe. Here's the recipe to make a STIFF consistency frosting. 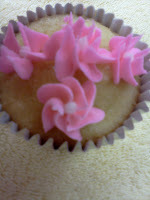 Wilton Vanilla Flavor - Wilton’s Vanilla is colorless so it won’t change the color of your icing. Wilton Meringue Powder - Wilton’s Meringue Powder is made of eggs. You can omit this if you have food allergies to consider. Lemon Layer Cake with Lemon Cream Frosting recipe originally published in Gourmet - January 2001. One of the things about the cake decorating class that I was anticipating was getting to bake a lot. We don’t keep too many sweets around here because my husband is like Cookie Monster… before he got all healthy and stuff. Seriously, what is so bad about occasionally indulging in cookies? It isn’t like I am overweight because Cookie Monster told me to eat sweets. Also, I think most kids realize that he doesn’t eat most of the cookies anyway because he’s shoving them in so fast, they crumble and fall out. At least I noticed that and wondered why he didn’t just slow down so he didn’t have to cram so many into his mouth. So I have a ton of cake recipes that I’ve never made because they are layer cakes and I have issues making layer cakes. They never fit together nicely for me and I couldn’t frost them to save my life. Now that is all over and done with since I’ve been taught how! Yippee!!!!! I’ve been sitting on this recipe for over 10 years. It was time. It is light and fluffy with a lovely layer of lemon curd between the layers. Don’t worry… I’m going to write a separate post regarding my second class and my first attempt at frosting and decorating a cake. Just enjoy the splendor that is my yummy cake right now. If anyone makes one of these recipes, I’d love for you to let me know, give me your thoughts and even take a picture or two. I’d LOVE to start posting updates from other Cook: s, such as myself. Don’t worry if it isn’t perfect. That’s the point of this blog.